The first of five regular-season USTA Florida Tennis on Campus events was held on Sept. 5-6, 2009, on the campus of Florida State University, where the University of Central Florida in the men's competition and the University of Florida in the women's stole titles from the host Seminoles at the FSU Capital Challenge. The University of South Florida also competed in the kick-off event to the 2009 season. The next event, the University of Florida Gatorbowl, is scheduled for Sept. 26-27, 2009, in Gainesville. Last year the Golden Knights of UCF, UF, USF, and the University of Miami all advanced to the National Campus Championships in Surprise, Ariz., where UCF finished third in the nation. "Our Tennis on Campus 'Chase for the Cup' got off to a great start," said USTA Florida Team Tennis Coordinator Michelle Willis. "FSU's club team did a great job getting a tournament organized at so early into the beginning of the school year. I hope this kickoff tournament encourages other schools to get involved in the UF Gatorbowl scheduled at University of Florida on Sept. 26-27. I am so impressed with FSU's Club President Augustino Columbo, she ran this event for the first time this year. It was so nice to see how all of the clubs pitched in to help her. These clubs are the definition of team." The host FSU did not leave the competition empty-handed as the twosome of Puc/Lamothe won the Women's Consolation title, and FSU's Robinson/Hendrickson won the Men's Consolation. "The tournament turned out great," Columbo said. "What I liked best was the fact that it was competitive but at the same time everyone from all the schools were so friendly and extremely willing to help with anything that needed to be done." The UCF team of Roesch/Duco came from a set down to win the Men's Main Draw title, beating UCF school-mates Coffey/Molino in the final. UF won the Women's Main Draw title when Pancione/Kleiner won a three-setter over UCF's Gaynor/McCardle. The USTA Tennis On Campus program provides college students with opportunities for team camaraderie, social networking, and rivaled competition through tennis without the rigors of a varsity program. Perfect for athletes who have chosen not to make the jump from high school to college varsity, Tennis On Campus offers co-ed team-based play, regional and national championship competition, and helps students maintain active and healthy lifestyles through their college years. Socialization is a large part of Tennis on Campus, and the program is keeping the fun of competitive tennis alive for the approximately 320,000 high school players each year who don't go on to receive scholarships to play college tennis. According to statistics, college and university club tennis is at an all-time high in popularity, with more than 30,000 participants across 500 participating schools. The no-cut philosophy of Tennis on Campus means everyone gets to play, no matter what their ability, but some large programs at schools maintain a traveling team of top players. Each of the USTA's 17 sections offers a USTA Campus Championship Section Event. The Florida section championship event will be held at the Florida Tennis Center in Daytona Beach on Feb. 27-28, 2010. 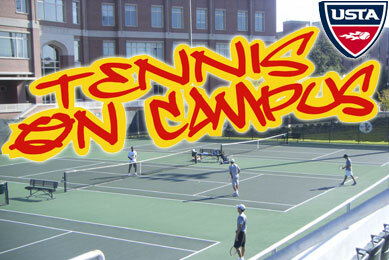 For more information on the Tennis on Campus program visit tennisoncampus.com. For info on Tennis on Campus in Florida, contact Michelle Willis at (386) 671-8937 or willis@florida.usta.com.